Who said that? 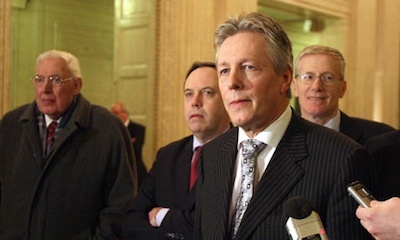 Peter Robinson speaking to the DUP annual conference in November 2012. The first part of that is true. We now know the second part was complete rubbish and so did Robinson when he said it. For a start we know that the DUP is at least two families, the Paisleys and the Robinsons and that they are at daggers drawn. Regardless of whether the meeting that took place in March 2008 was exactly as Paisley described it, the result was the same - a good old-fashioned political assassination. It had to be so. Paisley was 81 and had no intention of going but go he had to because, as anyone could see from his performance in the assembly and in his daily appearance, he was no longer in possession of his full faculties. All that remained was his monstrous ego, as ever blinding him to reality. Even today at 87 he is still bitter at being given the heave-ho but if he hadn’t been ousted he would still have been staggering around spewing bile as he did all his life and in his two recent interviews. It’s interesting that his plight has attracted no sympathy from any quarter. Perhaps that’s because the interviews showed Paisley has not changed at all. True, in place of the loud-mouthed demagoguery there is the high-pitched piping of an old man but he is still the sly master of d and the nasty slap down. Equally no-one has any sympathy for the victims of Paisley’s venom: Robinson on the one hand, the man who couldn’t keep his seat, ha ha, or his wife either ha ha, as Paisley reminded the viewers. On the other hand there’s the victim of Paisley’s contempt, ‘the mighty Dodds’, who didn’t know what he wanted. Dodds, a charisma-free zone, who, as Eileen reminded people, without the job Paisley gave him would have got nowhere in politics. However, it wasn’t just because Paisley was manifestly decrepit that they got rid of him. The people behind the putsch, and there were many more than Robinson and Depooty Dawds, needed Paisley to bite the bullet and agree to share power with Sinn Fein in 2007. The likes of Robinson and his deputy could never have carried that sea change through the DUP. By 2008 they were alarmed that he was going too far, looking too matey with Martin McGuinness, allowing Sinn Fein too much leeway. Remember the DUP’s ‘dirty dozen’ among whom was numbered Dodds, who strenuously objected to the St Andrews agreement in 2006 but didn’t have the guts to stand up to Paisley? Lord Morrow, also one of the dirty dozen and one those attending the execution in 2008, sounded increasingly unhappy as the implications of sharing power with Sinn Fein sank in. Some of those who went along with the St Andrews agreement, the DUP’s fig leaf for signing up to the Good Friday Agreement, never accepted the Good Friday Agreement’s principles which the St Andrews agreement studiously avoided. Some of the dirty dozen resisted the devolution of policing and justice to the bitter end in 2010. Dodds said devolution of policing would not happen ‘in a political lifetime’. So while it’s great fun watching the lying and deceit, the accusations and acrimony, what you have to understand is that the putsch in 2008 had a political purpose, which has become more apparent with every week that passes. It’s as follows. Robinson and Depooty Dawds were determined to remove Paisley because he was working the Good Friday Agreement, actually sharing power with Martin McGuinness to the growing dismay of a clutch of DUP MLAs who had spent the whole of their political lives opposed to the very concept of sharing power with Fenians. Getting rid of Paisley was the only way to slam on the brakes. Can you name a single substantive item agreed at the executive between the DUP and SF since the 2008 putsch?